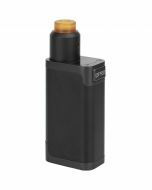 The CoilArt Azeroth Unregulated Squonk Box Mod is both compact and easy to operate. The squonk bottle included is a 7mL food grade silicon bottle and allows you to fill it with your e-liquid of choice. 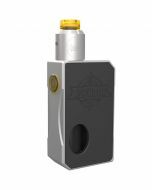 This squonking device is powered by a single 18650, 20700 and 21700 battery. The Coil Art Azeroth 7ml Squonk Box Mod has a built-in 7-millimeter food-grade silicone bottle hidden inside its durable housing. Fill it with your favorite e-liquid, and the box mod automatically feeds small amounts of e-juice to the rebuildable drip atomizer as you vape. This way, you enjoy the taste of dripping without any of the work. Plated with carbon fiber, the Coil Art Azeroth 7ml Squonk Box Mod has a sleek, sophisticated appearance. The anodized aluminum body is lightweight, yet durable enough to hold up to the effects of daily use. At 85.5 millimeters by 50 millimeters by 27 millimeters in size, the box mod is ready to travel. Its intelligent Ultem fire button lets you easily hit the mod on the go. With the Coil Art Azeroth 7ml Squonk Box Mod, you get the flexibility to power your mod the way you prefer. 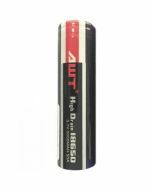 A self-adjusting battery contact allows you to install one 18650, 20700 or 21700 battery. You don't need to worry about adding or removing an adapter if you switch between different types of power cells. All specifications, descriptions, product characteristics and claims are based on manufacturer information. It is important that you have good understanding and technical knowledge on how to use this product in order to ensure proper and safe operation. 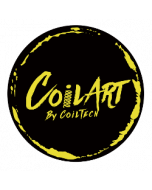 Rebuildable Atomizers are intended for ADVANCED USERS ONLY, who have the knowledge and experience in building coils and wicks, basic electronics knowledge, and can use a multimeter to test all built coils before use. Rebuildable Atomizer Coils and Wicks have known risks and must be carefully tested with a multimeter after building and before use, as faulty coils and wicks will blow electronic devices. 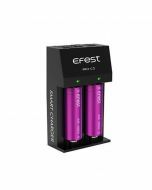 If this product has a Rebuildable Atomizer and you are not comfortable using the needed tools, we suggest that you do not purchase this product and explore simpler options. Use Rebuildable Atomizer products at your own risk and please be safe. ALL 18650 / 21700 / 20700 Li-ion (Lithium-ion) and LiPo (Lithium-ion Polymer) Rechargeable Batteries MUST be matching in brand, model, and specifications for use in any MOD BOX, KIT, CHARGER, and ANY DEVICE at ALL TIMES. Discharging and recharging of batteries should be done within the same grouping. Never use damaged or improperly wrapped batteries with any device. Failure to do so may result in injury. Please make sure to have proper knowledge of using and handling rechargeable Li-ion (Lithium-ion) and LiPo (Lithium-ion Polymer) batteries before purchase or use. Use safety precautions when handling Li-ion cell batteries as they can be dangerous if used improperly. Due to their sensitive characteristics to charging, discharging, and risks of short circuiting, batteries may explode, burn, or cause a fire if mishandled. DO NOT make any modifications to the batteries in any way, shape, or form. DO NOT overcharge Lithium-ion batteries. NEVER leave batteries unattended while they are charging or leave charging overnight and ALWAYS remember to charge them on a clean and fire-proof surface. DO NOT use Lithium-ion batteries in any devices without built-in protection circuit board (PCB) that is capable of detecting shorts, over-discharge, over-charging and so forth, as it is deemed unsafe and increases risk of fire or explosion. ALWAYS use a plastic battery case or non-conductive container to store and transport your batteries when they are not in use. DO NOT place loose batteries in your pocket, purse, bag, or anywhere else or allow them to come into contact with any metal objects such as loose change, keys, or anything else metal, as this may cause the batteries to short circuit and possibility of burning and or exploding. ALWAYS keep your batteries away from heat, sun, and hot surfaces to prevent any overheating. ALWAYS inspect your batteries cells, chargers, or any other devices for any physical damage before use. If you detect any physical damage, including rips or tears in the battery cell wrapping, immediately discontinue use of these products and dispose of them properly. ALWAYS dispose any battery cells, chargers and other electronic devices in accordance with local laws and mandates. Ozone Smoke will not be held liable or responsible for any injury, damages, defects of permanent or temporary caused by use of Lithium-ion batteries, chargers, devices and other products. Use at your own risk. This product is covered by our 30-Day Limited Return Policy and Warranty against any manufacturer defects from the date of delivery. Accidental damage, scratches and / or discoloration from regular use are considered normal wear and tear and are not covered by our 30-Day Limited Return Policy and Warranty. After 30 days from delivery products cannot be returned for a refund or replacement by Ozone Smoke. Replacement or repair of products, therefore, is your exclusive remedy under the ORIGINAL manufacturer’s warranty policy. We highly recommend you keep the original packing or take picture of the code on the side of the box before discarding it, as the ORIGINAL manufacturer may need the serial number on the side of the box to provide a replacement or warranty service. ALL RETURNS ARE SUBJECT TO A NON-REFUNDABLE SHIPPING CHARGE. CUSTOMER MUST PAY RETURN SHIPPING. For complete details of Ozone Smoke Warranty and Return Policy click here.